Bettina Pousttchi: World Time Clock at Kunsthalle Basel is the first major solo exhibition in Switzerland of works by Berlin-based German-Iranian artist Bettina Pousttchi. The show is also the first comprehensive institutional presentation of the artist’s oeuvre. Bettina Pousttchi has gained widespread attention recently with her large-scale, site-specific photographic work “Echo” (2009/2010) that involved covering the Temporäre Kunsthalle Berlin (Temporary Kunsthalle Berlin) with a digitally manipulated collage of archival images of the German Democratic Republic’s Palast der Republik (Palace of the Republic). On view at Kunsthalle Basel are “Sculpture Project Echo” (2009), a series of color photographs related to the “Echo”-installation; the video work “Conversations in the Studio 3” (2010); two installations of sculptural works using crowd-control barriers titled “Double Monuments for Flavin and Tatlin” (2010) and “Blackout” (2007-2010); the ongoing “World Time” series (2008-), photographs of clocks on public buildings in different cities of the world; the photographic series “THe Hetley Suite” (2008); the two early video works “Ocularis” (1999) and “Double Empire” (2000). Bettina Pousttchi was born 1971 in Mainz, Germany. She currently lives and works in Berlin. Pousttchi studied a.o. at the Kunstakademie Düsseldorf and the Université de Paris, St. Denis. In 1999/2000 she joined the renowned Whitney Independent Studio Program at the Whitney Museum in New York. Her solo exhibitions include a.o. the project Echo at the outside facade of Temporäre Kunsthalle, Berlin over the course of six months (2009/2010); The Hetley Suite, Triangle Gallery, London (2008); Reality Reset, Von der Heydt Museum/Kunsthalle Barmen, Wuppertal (2007); Screen Settings, Württembergischer Kunstverein Stuttgart (2003) and Die Katharina-Show, Museum Morsbroich Leverkusen (2001). 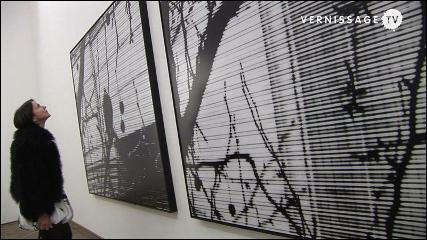 Different works by the artist were shown at the Venice Biennale in 2003 and 2009 as well as in numerous group shows. Bettina Pousttchi: World Time Clock / Kunsthalle Basel. Opening reception, January 15, 2011. PS: See also our coverage of the “Echo”-project with an interview with Bettina Pousttchi. Kunsthalle Basel proudly presents the first major solo exhibition in Switzerland of works by Berlin-based German-Iranian artist Bettina Pousttchi. Entitled “World Time Clock”, the show is also the first comprehensive institutional presentation of the artist’s multifaceted oeuvre. Pousttchi, who was born 1971 in Mainz, Germany, has recently received due attention for her large-scale, site-specific photographic work Echo (2009/10). The recent project involved covering all four elevations of the Temporäre Kunsthalle Berlin (Temporary Kunsthalle Berlin), built in 2008 by Adolf Krischanitz and situated in the historical centre of Berlin, with a digitally manipulated collage of archival images of the glass skin and concrete pilasters of the nearby Palast der Republik (Palace of the Republic). The Palace, a landmark of late Eastern European modernism, was designed by Heinz Graffunder and completed in 1976, when it became the seat of the German Democratic Republic’s Volkskammer (People’s Chamber, or parliament). For Echo, Pousttchi’s black-and-white, digitally manipulated representation of the Palace temporarily replaced the perfect neutrality of the Temporary Kunsthalle’s white cube. In this “battle of fake facades”, as the artist puts it, the Kunsthalle, the Palace, and Pousttchi’s own work that mediated between the two, all met their inevitable end. Echo was duly taken down after its scheduled six-month-long presentation. The Palace of the Republic, meanwhile, was dismantled in 2009 to make room for the future reconstruction of the 18th-century Berliner Stadtschloss (Berlin City Palace). Most of the Palace’s steel girders were sold to the United Arab Emirates and used to construct the Burj Khalifa in Dubai, which, at 828 meters, is now the tallest building in the world. Finally, the Temporary Kunsthalle closed in August 2010, according to plan. Sculpture Project Echo (2009), Pousttchi’s series of twentyfour colour photographs created in the six months during which Echo was on view, is a much-layered portrayal of this black-and-white photo installation’s powerful persistence among the iconic buildings that surrounded it, including the Berliner Dom (Berlin Cathedral), the Alte Nationalgalerie (Old National Gallery), the GDR-built Fernsehturm (Television Tower, which, at 368 metres, is still the tallest structure in Germany), and the uncovered foundations of the original Berlin City Palace. Nestled in between the prominent edifices that fill Pousttchi’s colour images, advertising banners that simulate facades of yet other buildings-to-be can be glimpsed, including a giant digital rendering of the facade of the planned reconstruction of Schinkelsche Bauakademie (Schinkel’s Academy of Architecture). As can be deduced from this photographic series, Echo served as a kind of fixed reference point for its changing architectural environs. Six images from the Sculpture Project Echo are on view at Kunsthalle Basel. Also on view is Pousttchi’s Conversations in the Studio 3 (2010), a new video work that serves as a metaphorical bracket for divergent motifs that are brought together in the current show. The video was created in two steps. First, Pousttchi filmed a conversation between herself and French conceptual artist Daniel Buren (1938-), who in the late 1960s began to live and work in situ, and thus gave up on conventional modes of art presentation, in an attempt to evade restrictions imposed by institutionalized art spaces in favour of the nomadic marking of different sites. In seminal essays such as “The Function of the Studio” (1970), Buren provides a pointed critique of the artist’s compromised and fixed position within the art system, in which the studio plays the fundamentally strategic role of a hideout, as well as of a privileged place where the work is produced and presented for the first time. 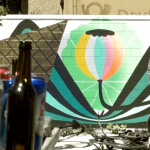 Accordingly, Pousttchi and Buren’s informal conversation touches on many dimensions of the public art project’s supposed publicness””and its constraints. Pousttchi realized the second phase of Conversations in the Studio 3 ‘s development in Warsaw, in the atelier-apartment of the late Polish artist Edward Krasinski (1925-2004), whose exhibition at Kunsthalle Basel took place in 1996. Similar and in kinship to Buren’s trademark vertical stripes on fabric, in 1969 Krasinski decided to suspend any gestural quality of his artwork through the use of the “blue scotch-tape strip”, which he pasted horizontally on walls, objects, and artworks at the height of 130 centimeters. Six years later, in 1975, Buren executed his own work in situ on the windows of Krasinski’s studio-apartment””exactly on the membrane between the studio (located on the top of a housing block in the centre of Warsaw) and the “situation” of the buzzing city around it. For her new video work, Pousttchi projected her carefully edited conversation with Buren on the walls and furniture in Krasinski’s studio, thereby animating the site with her “conversational” video piece. Her projection also literally built on the presence of the many black-and-white photographs that Krasinski applied to his studio’s walls and objects, which he used to double and mirror spaces and objects. By commemorating visitors with small “photo-souvenirs” and installing works of art in the most unexpected nooks and crannies, Kransinski turned his studio, over many years, into his living-andworking site proper. To that end, Pousttchi inscribed her own investigative work, albeit again only temporarily, in the now petrified shape of the once changing studio. With its three protagonists, the artists Buren, Pousttchi, and Krasinski in discussion, Conversations in the Studio 3 transcends the real time and space of the “function of the studio”. The video work also resembles (or echoes) Echo insofar as the latter can be seen as an attempt to stage a conversation””or a fierce polemic””between three discrete buildings. Opening and closing Pousttchi’s exhibition on the Kunsthalle’s ground floor are two installations of sculptural works that make use of crowd-control barriers, those sculptures of public infrastructure designed to manage cheering crowds, parades, or demonstrations. In this series of Double Monuments for Flavin and Tatlin (2010), the white-painted and vertical steel barriers have been twisted around and set atop each other to form structures resembling the seminal Monument to the Third International. Designed in 1920 by Vladimir Tatlin (1885-1953) to commemorate the Bolshevik Revolution, the spiraling, 400-metre-tall high-rise was only finally realized as a model, which was then presented at the 1925 Paris Exposition Internationale. Tatlin’s monument to the collective forces of revolution was also invoked in Dan Flavin’s series of thirty-nine sculptures he called “monuments to V. Tatlin” (1964-1990), which featured fluorescent tubes arranged in shapes as various as pyramid and early skyscraper. With a dose of sly humor, Pousttchi’s series pays homage to the champions of, respectively, Constructivism and Minimalism””or perhaps stages a battle, Tatlin vs. Flavin, by piercing the steel structures of her “Double Monuments” with light tubes. Another group of works, Blackout (2007-2010), features five sculptures made of black-painted crowd barriers that appear to collapse languorously on white pedestals, as if mocking the modernist, semi-abstract figures of “reclining women” that populate sculpture gardens of museums of modern art around the world. In her ongoing World Time series (2008-), from which this exhibition takes its name, Pousttchi photographs clocks on public buildings in different cities of the world””so far the series includes clocks in Shanghai, Istanbul, London, New York, Basel, and Warsaw””that exist in different time zones. The clocks always show the same hour, five minutes to two, thus equating the remote locations through the sameness of the global, unified measure of time. But the theme is also taken up elsewhere: Pousttchi’s Echo installation featured images of two clocks, one set for five to one, the other for five to two, on the Western and Eastern elevation. 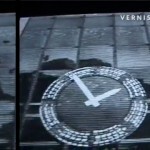 Moreover, in the public work Basel Time (2010), the artist manipulated the image of the huge clock on the facade of the Hall 2 building at Art Basel’s Messe complex (designed in 1953), and placed it on the facade of Hall 1 (designed in 1926), which is slated for demolition in advance of an upcoming building project by Herzog & de Meuron. Pousttchi reprises this interest in noting a brief interval and underscoring the gap between real time and the time of taking a picture in the photographic series The Hetley Suite (2008), also on view at Kunsthalle Basel. Furthermore, two early video works in the exhibition, Ocularis (1999) and Double Empire (2000) expand the notion of parallax””from the phenomenon associated with stereoscopic seeing to the doubling and splitting of the film’s very subject. Ocularis features a slow pan out from the looming red-moon-like shape that fills the screen to the almost technical image of two oculars of the microscope; as the drop of blood disappears from view, the viewing device itself became exposed to our own observation. In contrast, and approximately the same 2:43 minutes long, Double Empire introduces the Empire State Building””the titular protagonist of Andy Warhol’s eight-hour classic””reduced to a seemingly endless freefall along the stream of brightly lit windows and dark elevations of the building. Only at the end of the film does the camera reach the tall spire of the Empire””the journey downward turns out to be a climb to the top. These two short epics serve as a coda to the entire exhibition, recapitulating the themes encountered in its other works. To that end, Bettina Pousttchi’s “World Time Clock” is an attempt to grasp something of the internal organization of the world today, in which reality has been replaced by a system of exchangeable appearances, ruled by the “universal clock” of a global economy. Bettina Pousttchi was born 1971 in Mainz, Germany. She currently lives and works in Berlin. Pousttchi studied a.o. at the Kunstakademie Düsseldorf and the Université de Paris, St. Denis, and in 1999/2000 she joined the renowned Whitney Independent Studio Program at the Whitney Museum in New York. Her solo exhibitions include a.o. the project Echo at the outside facade of Temporäre Kunsthalle, Berlin over the course of six months (2009/2010); The Hetley Suite, Triangle Gallery, London (2008); Reality Reset, Von der Heydt Museum/Kunsthalle Barmen, Wuppertal (2007); Screen Settings, Württembergischer Kunstverein Stuttgart (2003) and Die Katharina-Show, Museum Morsbroich Leverkusen (2001). Different works by the artist were shown at the Venice Biennale in 2003 and 2009 as well as in numerous group shows such as The Right to Protest, Museum on the Seam Jerusalem (2010); Mixtapes, Lewis Glucksman Gallery Cork (2010); Why do you resist?, Pori Art Museum Finland (2010); Next Generation, Kunstmuseum St.Gallen (2010); Immortality, TENT Rotterdam (2009); km 500#2, Kunsthalle Mainz (2009); Pièces de Résistance, Kunstmuseum Thun (2009); Oppositions & Dialogues, Kunstverein Hannover (2009); Zeitblick, Martin-Gropius-Bau Berlin (2008); Berlin-Buenos Aires Art Exchange, Centro Cultural Recoleta, Buenos Aires (2007); Transparency, Middlebury College Museum of Art (2007); Anstoss Berlin, Haus am Waldsee, Berlin (2006); Die Jugend von heute, Schirn Kunsthalle Frankfurt am Main (2006). In 2010 Pousttchi realized the project Basel Time at the outside facade of Art Basel in the context of Art Public Projects.